Some people just love the wide	open spaces of the Klein Karoo,	others appreciate the fact that	they are hiking a world heritage	site, still others appreciate the	beauty of walking through an	ecological hotspot where three	plant biomes (succulent karoo,	cape thicket and fynbos)	converge and there are even	those who venerate the sound	of silence present in our region,	but EVERYBODY who is anybody	HAS TO DO A KLEIN KAROO	HIKING TRAIL before they walk	eternity . . .
As soon as visitors to the Klein Karoo (especially the	Oudtshoorn De Rust region) have experienced the	hospitality and tranquility of this paradise and its	people, they can think of no other place more suitable	to escape to. This truth is as old as our hills because	many spectacular sunsets ago the San first	explored the Swartberg on foot and left us their	intriguing rock art. Therefore, if you are a compulsive	hiking enthusiast these mountains are your personal	passport to rugged adventure in the midst of	the splendour of natural Klein Karoo beauty. The best times for hiking the Swartberg	trails are April / May and September / October with	options ranging from easy day hikes to a fairly demanding	4 day route, leading hikers past rock formations,	incredible views and unspoilt fynbos. 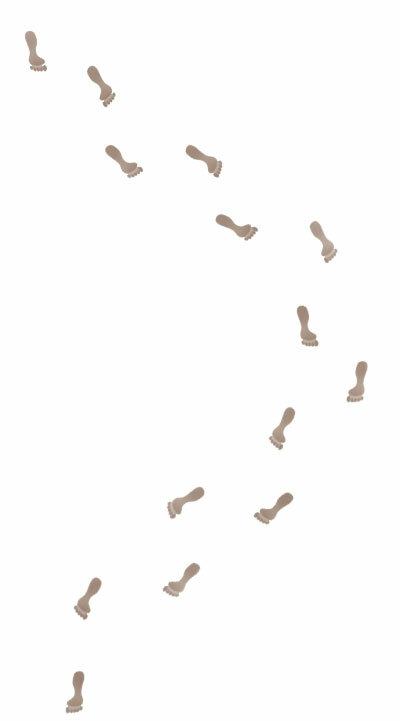 This trail	has 3 alternative starting points with overnight huts at	Ou Tol and Bothashoek. Gamkaskloof, 90km from Oudtshoorn, 60 km from	Prince Albert is only accessible from the Swartberg	Pass via the Otto Du Plessis Road. This road is not	accessible by caravan, there are no shops and fuel	stations along the way and visitors need to bring	sufficient food for the duration of their	stay. Accommodation in restored cottages, camping	sites or bush camp. Visitors can enjoy picnicking and	angling and walk the 6km (3 hrs) interpretation trail. No quad bikes are allowed and motorcycles only with prior	permission. There is a sense of space, detachment and wildness	about Gamkaberg and the neighbouring Rooiberg. 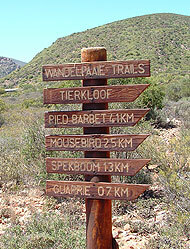 Some visitors explore the Tierkloof ravine, others do	the multi-day hike to Oukraal. Three lodges with sheltered safari-style tents, a braai lapa/kitchen, ablutions and cement dams in which to cool	off are available. The converted stables and adjoining camp site can accommodate 12 people. Starting in the succulent karoo, this is a moderately	strenuous trail taking hikers through a deep	forested ravine to a fynbos-covered mountain plateau. Here they overnight at Oukraal camp and	enjoy spectacular views of the Swartberg and	Outeniqua mountain ranges. Minwater (meaning "Little Water") is a private nature	reserve and is situated 24km southwest of	Oudtshoorn in the foothills of the Gamkaberg in the	Klein Karoo. It is a rough mountainous region containing	hills and a large plateau with breathtaking	views of the eastern Klein Karoo and surrounding	mountain ranges. Owner, Louis Jordaan, possesses a	wealth of knowledge of the more than 500 different	plant species that bloom on Minwater. Table Mountain in Cape Town is believed to be one of the oldest mountains in the world. Table Mountain is approximately 260-million years old. By comparison, the Andes are about 250-million years old, the Rockies are about 60-million, the Himalayas are 40-million and the Alps are 32-million years old.